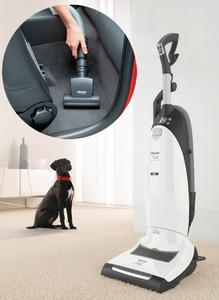 Comes with STB101 Tubobrush., With versatility and maneuverability and an unmatched filtration performance, the Miele S7 is the perfect fit for every pet owner, so quiet that even the furry friends will love it. The Dynamic U1 features the renowned Miele AirClean filtration system. The Active Air Clean filter (AAC-30) with active charcoal absorbs odors and removes pet smells with ease, while retaining pet hair, dander and any fine particles to keep the indoor air fresh and clean - providing a healthy home for the entire family. In addition to the powerful S7 brush roller with an automatic height adjustment for all floor surfaces from hardwood to high-pile carpet, the Mini-Turbobrush (STB 101) is ideal for vacuuming stairs, upholstery or car interiors. 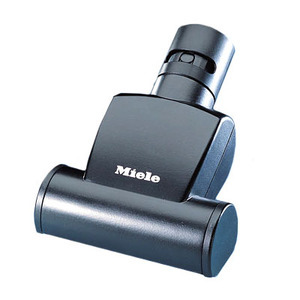 And finally the electrostatically charged material of the Miele AirClean filter-bag traps micro-sized debris with 9 layers of filtration and the spring-loaded self-sealing collar protects from inhaling any dust or dirt when replacing the bag, making the removal of the vacuum cleaner content the same quick and clean experience as vacuuming with the S7260 Cat & Dog. Miele STB 101 comes in the box.